At Zimmer and Peacock we have a number of biosensors suitable or adaptable for continuous monitoring, including: continuous glucose monitoring (CGM), continuous lactate monitoring (CLM), potassium monitoring, sodium monitoring, sweat monitoring and hydration monitoring. In the notes below we start a discussion on how ZP characterises such sensors, we specifically use the example of glucose, though the technique can be extended to other analytes. 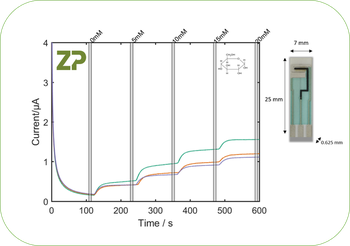 In the adjacent image a ZP CGM sensor is tested over a range of glucose concentrations. In this example of raw data from a CGM we can we how the current increases with glucose concentration. Our raw data from the image above can be converted into information in the first instance by plotting signal versus concentration; we have illustrated this in the adjacent figure; we have analysed the signal at each glucose concentration and made a calibration curve with a linear fit. 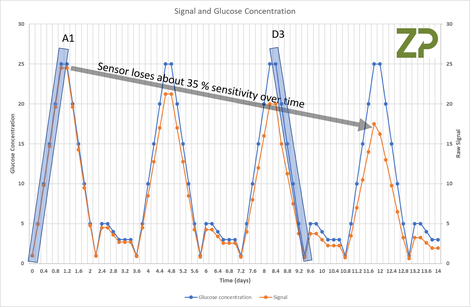 In the adjacent image a sensors was tested over several days and the raw signal is plotted against the glucose solution used to test the CGM. ONE - Reformulate the sensor so it is stable. TWO - Have a periodic calibration routine with a known concentration in a calibration solution and adjust the sensors calibration factors. In the sensor drift data above for a theoretical CGM sensor there are two parameters, that can drift with time, the baseline and the sensitivity, the volume of raw data can be reduced to two parameters which can quantify the overall sensors drift by calculating the baseline drift and sensitivity drift. Zimmer and Peacock are world leading contract developer and manufacturer of sensor, biosensors with a wide range of application experience including continuous glucose monitoring (CGM), if you have any questions please don't hesitate to contact us.